Sometimes LIFE just get's so crazy busy. cuz it's a crazy busy life. For the past several weeks I've started and ended my days in the Hummingbird Garden. cuz he's really crazy busy. These little hummers put on quite the show. and have gathered tons of information. It may take me years to sort out all the images. BTW, have you ever seen a Hummingbirds feet? but never have I seen them perched quite like this before. Indeed, a busy, busy life. Beautiful post as always. Great shots of your humming bird friend. What wonderful photos. Little birds are so difficult to capture on camera. Just beautiful. Yes they are... they require a great deal of patience. Awesome photos! I can just imagine the joy you must have had wandering into the garden and quietly capturing them. Thank you for sharing them. I didn't think hummingbirds ever sat still, so there you go. They have feet like our little honeyeaters. Oh I've discovered their routine... they actually sit for very long periods. It's very funny Hummingbird! Great photos, Carolyn! I think those feet are a big deal too, beautiful photos!! Giggle... a girl after my own heart. Wow! Wonderful pictures. I love to watch hummingbirds and am always thrilled to see them in my garden. I rarely get such good photos, however! For every several hundred pictures I take of them, I find a handful of keepers. But those keepers... they really make me smile. How fun! We have occasional hummer guests, but they prefer the neighbors' feeder in the sun. So, I never get photos of them (I know--never say never!) I did get some good hummer shots at my parents' house a couple of summers ago. They're fun to watch. Great captures--especially the one with the perching feet! This morning the gardens were alive with them... they will soon be leaving our gardens on their way south. I'll have to come up with a new hobby. Carolyn girl hello there ! I wish we had seen some this year .. it is scary ... we have not seen these or any colourful butterflies .. not a one ! just small white moth like ones. We have quite the party going on here... enough hummingbirds to keep us entertained. Besides the Black Salvia, they are mesmerized by the Monarda. Those blooms have been there since the end of June and are looking quite haggard, but the hummers can't get enough of them. Joy, I love the smell of pineapple... I'll have to look into that Pineapple sage. Hope your week was nice and you have some fun planned for the weekend! I shoot with a Nikon D5000. 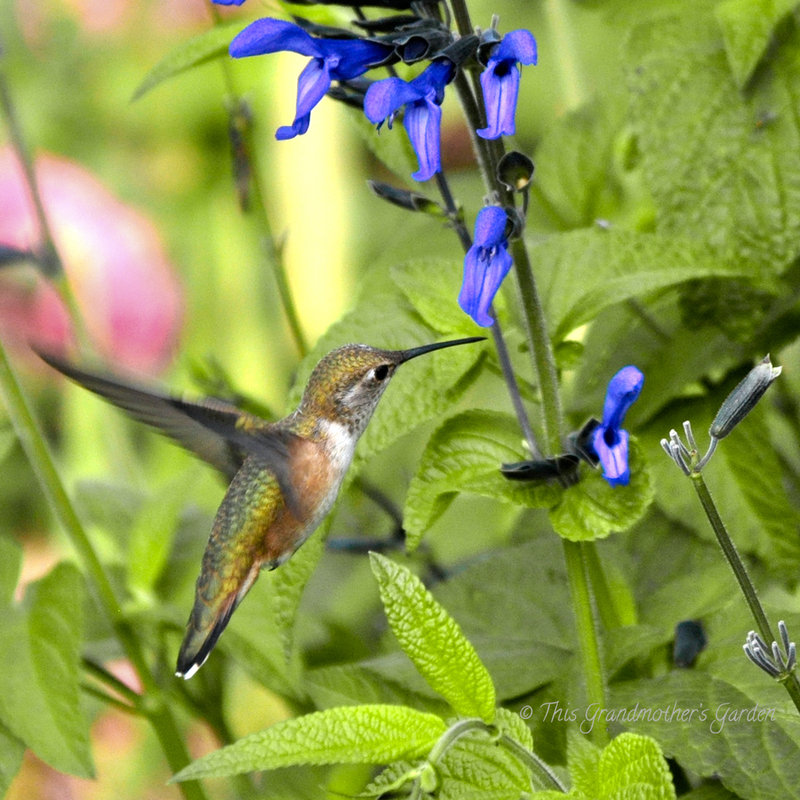 However, when I first began blogging in 2010, I only had a Canon point and shoot and I must say, those hummingbird pics turned out mighty fine. I love your hummingbird pictures! Yes, their little feet are teeny-tiny! We have such fun watching these little birds and buy sugar for their sugar solution all summer long so that we get regular visits. 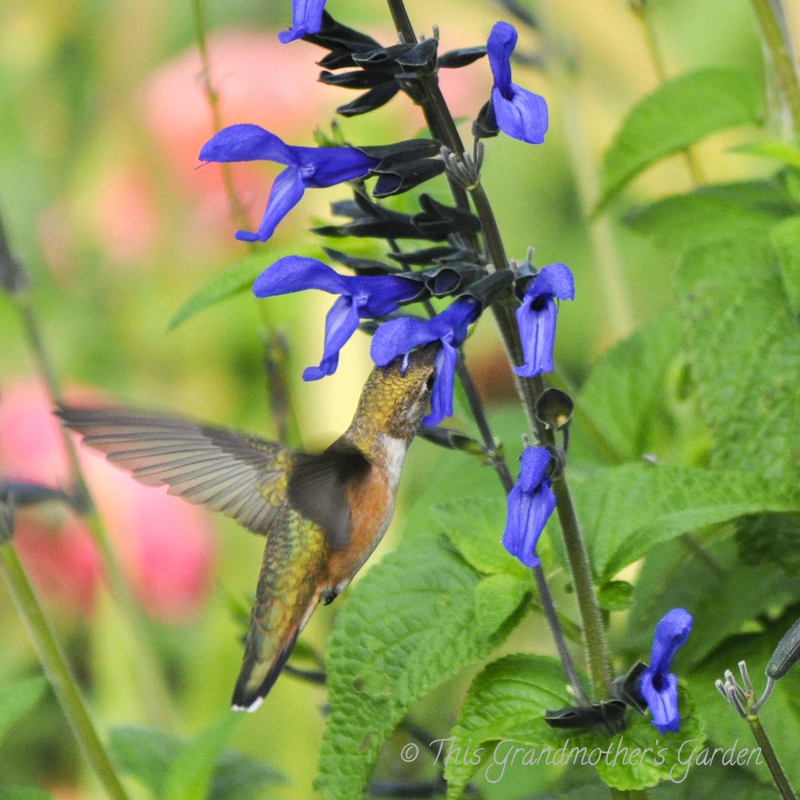 This time of year, the hummers are really busy getting their fill of energy for the long commute ahead of them! Yes and any day now I could go out there and they will be gone. (Sigh.) Thankfully they always come back.) Ours don't pay any attention at all to the feeders until the nights begin to get cool. Then they go crazy over them. That's when I know my days with them for this season are numbered. Your hummingbird pictures are simply great. You must have used very high shutter speed to capture them with such clarity. I tried to capture some hovering sunbirds but the photos turned rather blurry. I shoot so fast I really don't know if I have any great images until I put them up on the computer screen. It takes a lot of clicks to get images I'm satisfied with... I was thrilled to see the little feet. somewhere I once read that people thought hummingbirds didn't HAVE feet. Thanks for you evidence that, of course the little birds have feet! I was tickled to capture this image. I click away so quickly that often I don't see the real image until I load them on my computer. This one made me giggle. They are so darling...and you have caught them midflight so gorgeouosly. Patience... and tons of clicks to find one good one dear friend. Superbe ces photos. Je n'ai pas encore réussi à en photographier. Félicitation! Beautiful photos :) I'd love one day to get the opportunity to try and capture these ... we don't have them here in the UK. It must be a wonderful end to the evening sharing that time with the hummers Carolyn. 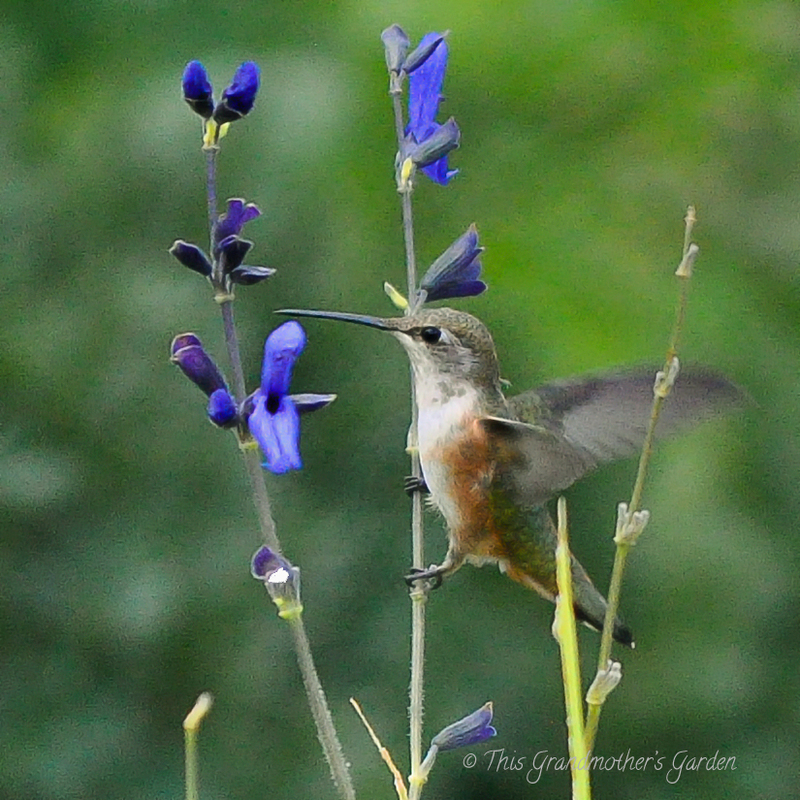 I just did post on these cuties on the other blog I write for...Beautiful Wildlife Gardens. We have lots of hummers and they perch on plants, vines, structures and twigs...I just adore their cute feet. I love watching them rest. Oh I will have to read your post! These are wonderful photos! 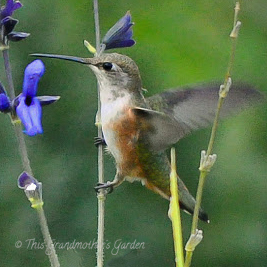 I adore seeing hummingbirds in my - or anyone's - garden! 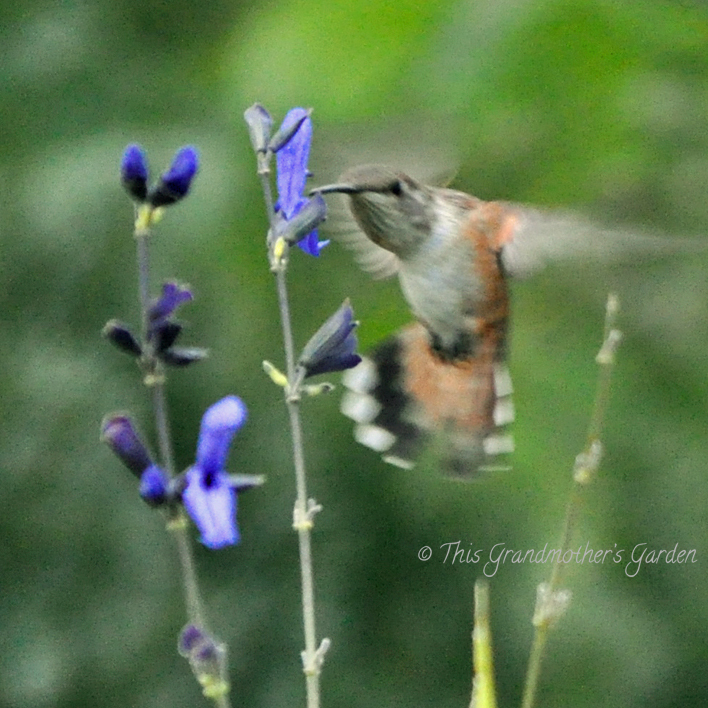 Any day they will be leaving my gardens to migrate south for the cold months... I will miss them! Your hummingbird photos are just wonderful! We had one little hummer visit us this summer. I had tangerine sage planted in a pot on the deck, and it came back several times to that one plant. It has made me want to see more! I think next summer I'll have a couple of containers devoted to them and see if I can get a few more! Tangerine salvia? That sounds delicious. Thank you for missing me, Beth. I've missed you too! All is well. I'll stop by to visit in a minute. I have never seen a Hummingbirds feet before, in fact I have never seen a Hummingbird. But who knows, what with climate change and all that stuff, you never know. Have to go, talk soon, I am busy, busy, busy. Oh Alistair... you are missing a real treat. You have to slow down long enough to see them!